6062 ∆ 48bG 20 Pfg. 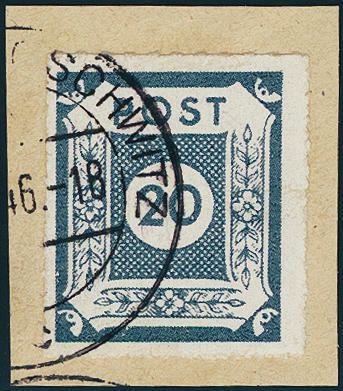 Blue-grey with linear roulette 9 1 / 2-11 from post office Loschwitz, in perfect condition on piece, a very scarce colour, photo expertize \"genuine and immaculate\" Ströh BPP. Michel 750,- €. 6063 ⊙ 48cH 20 Pfg. Blackish blue gray with linear roulette 10 from post office Pirna, fresh colors and neat cancelled, photo expertize \"genuine and immaculate\" Ströh BPP. Michel 1400,- €. 6064 48Gb 20 Pfg. 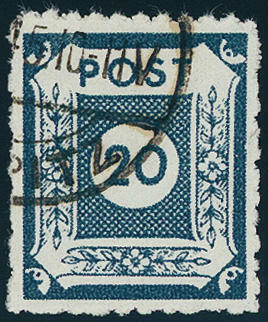 Blue-grey, postmaster roulette from Loschwitz, the scarce colour from left margin of sheet, fresh colors and in perfect condition mint never hinged, expertized Ströh BPP. Michel 600,- €. 6065 48Gb 20 Pfg. 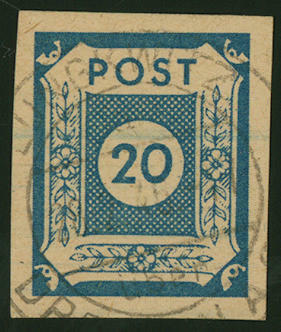 Blue-grey with postmaster roulette from post office Loschwitz, the good colour, fresh colors and in perfect condition mint never hinged, photo expertize \"genuine and immaculate\" Ströh BPP. Michel 600,- €. 6066 49A 25 Pfg. 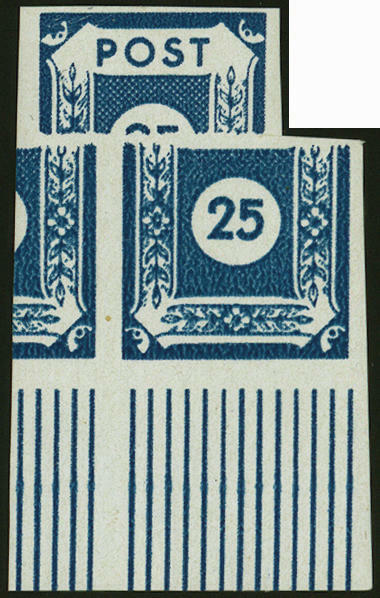 Blue, with strong displaced stamps image printing, from lower margin of sheet, in perfect condition mint never hinged in perfect condition. Through a blackout the printing machine during of the Pressure was only the upper half stamp in the tenth sheet row printed. 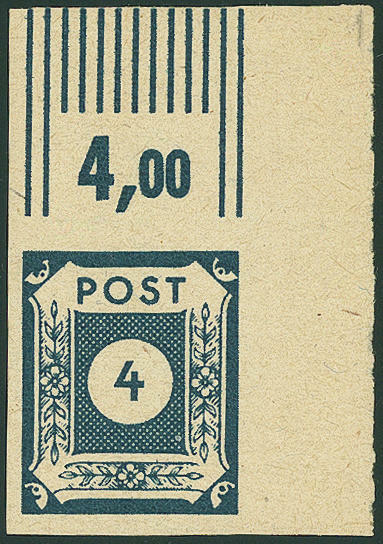 By restart of the Pressure deferred be the printing sheet and the lower design of the stamp was about 7 mm to the right shifted printed. A significant Soviet Zone rarity of the only another pieces recorded is! Photo expertize \"genuine and immaculate\" Ströh BPP. 6067 49ADDII 25 Pfg. Blue on 15 Pfg. Dark brown yellow, in the double impression, as well the 15 Pfg. 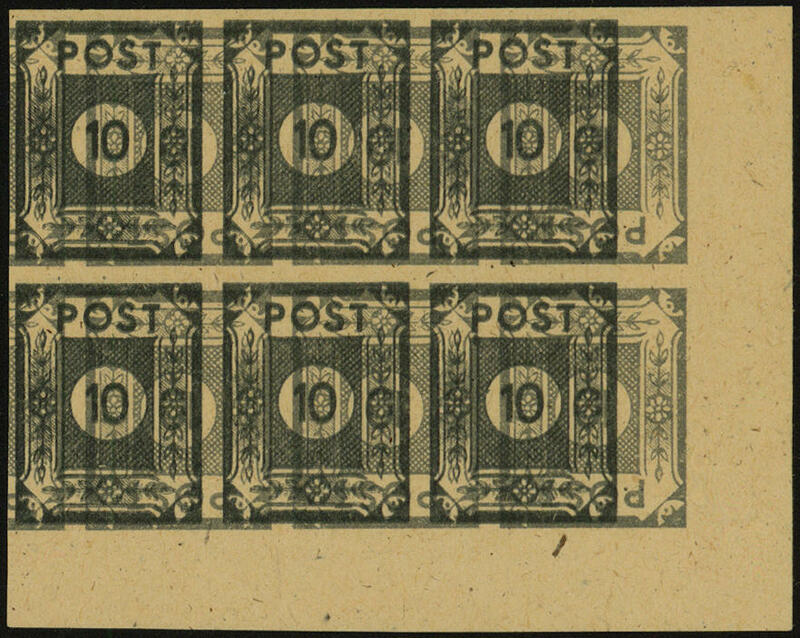 Inverted, block of four from left margin of sheet, in perfect condition mint never hinged both prints are besides strong to each other shifted. Photo expertize \"genuine and immaculate\" Ströh BPP. 6068 49FII 25 Pfg. 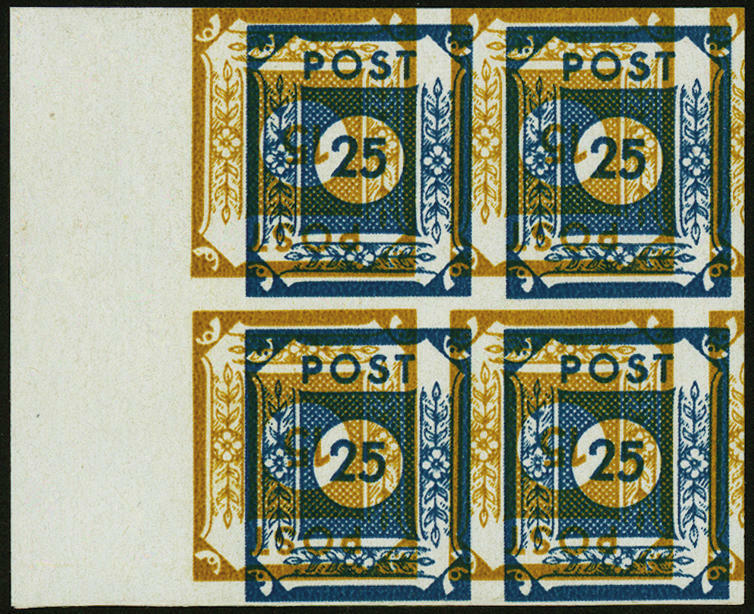 Blue, with lines perforation 10 3 / 4-11 from post office Klotzsche, with variety \"25 with hump\", fresh colors, very well perforated, in perfect condition mint never hinged expertized. Ströh BPP. Michel 200,- €. 6069 50DIIIUMs 40 Pfg. 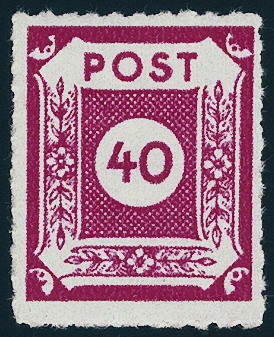 Dark reddish lilac, in the horizontal pair, in the middle unperforated, from of the right upper corner of the sheet, with lines perforation 11 ½ from post office Coswig, fresh colors, very well perforated, in perfect condition mint never hinged an extremely rare variety in perfect condition, by Michel unknown! Photo expertize Ströh BPP. 6071 51IIbuyDDD 3 Pfg. 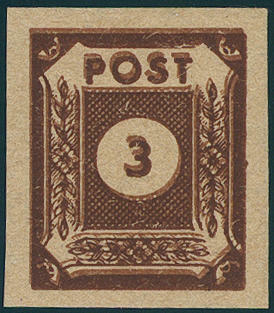 Brown black on black brown on light grey brown, the scarce triple impression in the horizontal block of ten from right margin of sheet, large margins all around and in perfect condition mint never hinged as well the right upper stamp in extremely rare type II (numeral of value 3 with blunt head), which only on field 70 in a small part of issue occurred. In this kind in the Michel special catalogue unlisted and one of the large rarities from East Saxons. Photo expertize \"genuine and immaculate\" Ströh BPP. 6072 ✉ 52atx,55 10 Pfg. Grey and 30 Pfg. 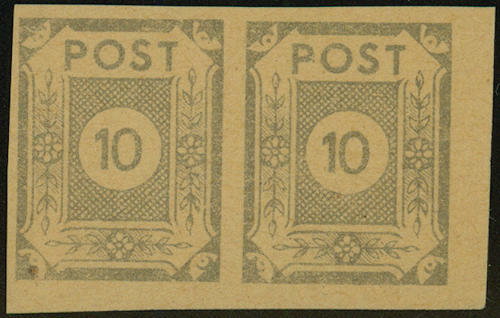 Bright brown yellow in mixed franking with German local issue Plauen 12 Pfg. 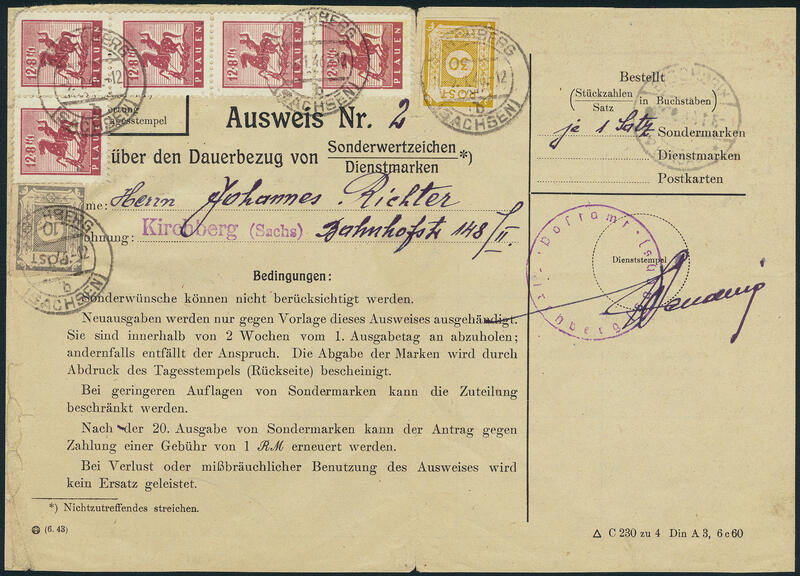 Reddish carmine (5) on postal service identification card from \"KIRCHBERG 3.1.46. \", centered vertical folded, extraneous. Such postal service identification cards from the OPD time are only very few have become known. These to class among the SBZ-rarities. Photo expertize \"genuine and immaculate\" Ströh BPP. 6073 52avyDDK 10 Pfg. 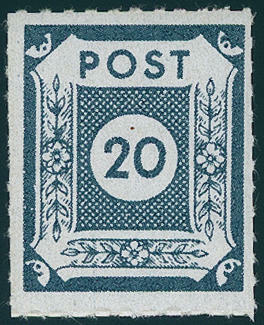 Dark gray on grey, triple impression with lower inverted printing, on greyish paper with steep falling paper pattern of stripes or streaks, in the horizontal block of six from of the right lower corner of the sheet, large margins all around, in perfect condition mint never hinged a scarce and spectacular unit in utterly perfect condition. Photo expertize \"genuine and immaculate\" Ströh BPP. 6074 52txPa 10 Pfg. Grey, vertical strip of five from upper margin, as well the third stamp with variety \"glued paper web\", fresh colors and in perfect condition mint never hinged a spectacular Soviet Zone rarity, like they also in the Michel special catalogue unlisted is. In this kind possibly unique! Photo expertize \"genuine and immaculate\" Ströh BPP. 6075 52uxV 10 Pfg. 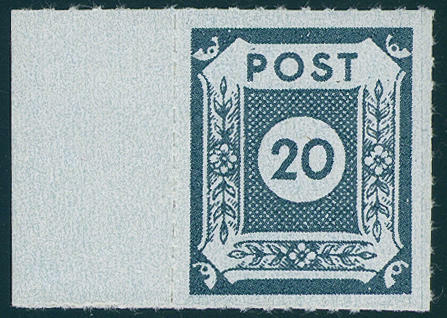 Light grey in the horizontal twenties souvenir sheet as so-called proof, in perfect condition on ungummed paper, reverse printed with increasing paper pattern of stripes or streaks. A spectacular unit for the advanced special collection, in this kind seeming unique! Photo expertize \"genuine and immaculate\" Ströh BPP. Michel 12000,- €. 6076 52uxV 10 Pfg. Dull gray, the scarce trial printing in the horizontal pair, in perfect condition on ungummed paper with flat increasing paper pattern of stripes or streaks, fresh colors in perfect condition, photo expertize \"genuine and immaculate\" Ströh BPP. Michel 1,600.- €. 6077 53b 4 Pfg. Black blue, the scarce colour from of the right upper corner of the sheet, excellent regumed, twice signed storm, photo expertize Ströh BPP. 6078 ⊙ 54b 20 Pfg. Vivid Prussian blue, wonderful fresh colors, large margins all around, centric cancellation \"LUNGKWITZ over DRESDEN 28.2.46. \" in utterly perfect condition. Of an of the most beautiful examples this large color rarity, the in almost all collections is absent! Photo expertize \"genuine and immaculate\" Ströh BPP. Michel 7000,- €. 6079 ✉ 56a 3 Pfg. 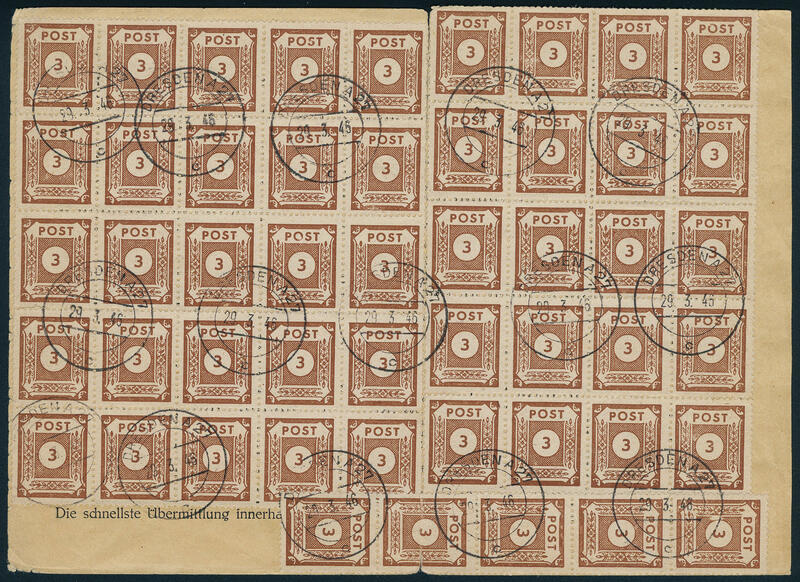 Bright orange brown, 50 pieces as spectacular mass multiple franking on gef. 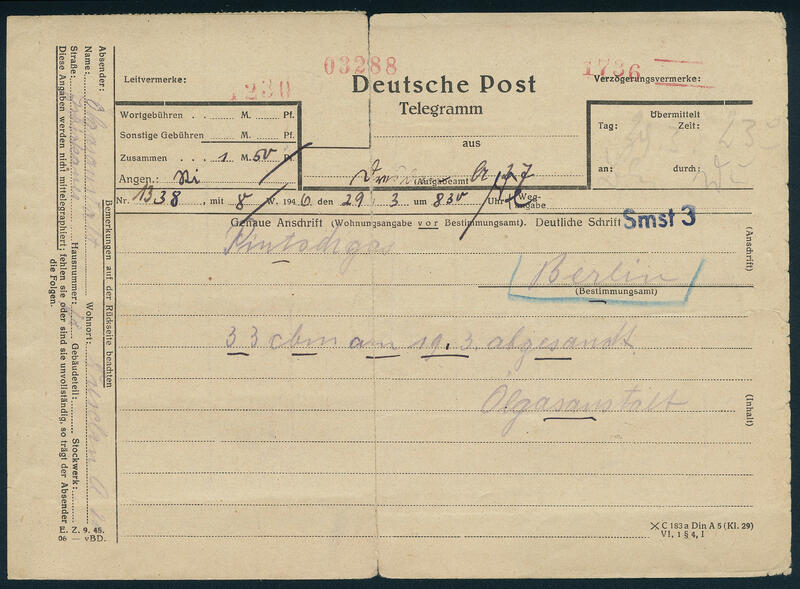 Telegram from \"DRESDEN 29.3.46. \", correctly franked franked, to Berlin. Franked telegrams from East Saxons to class among the large rarities of this area. With this spectacular mass franking is an one of the absolute top pieces of the SBZ! Photo expertize \"genuine and immaculate\" Ströh BPP. 6080 56aDDU 3 Pfg. Dark-orange-brown on bright orange brown in the double impression unperforated, vertical pair, fresh colors and with wide margins, in perfect condition mint never hinged the upper double impression is blunt shifted, against what the lower double impression almost centric one above the other printed was. 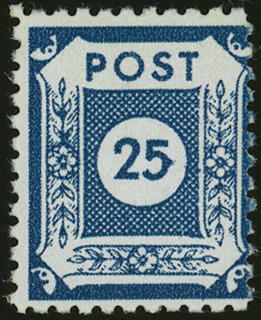 An especially decorative and in this kind extremely scarce variety! Photo expertize \"genuine and immaculate\" Ströh BPP. 6081 56aDDU 3 Pfg. 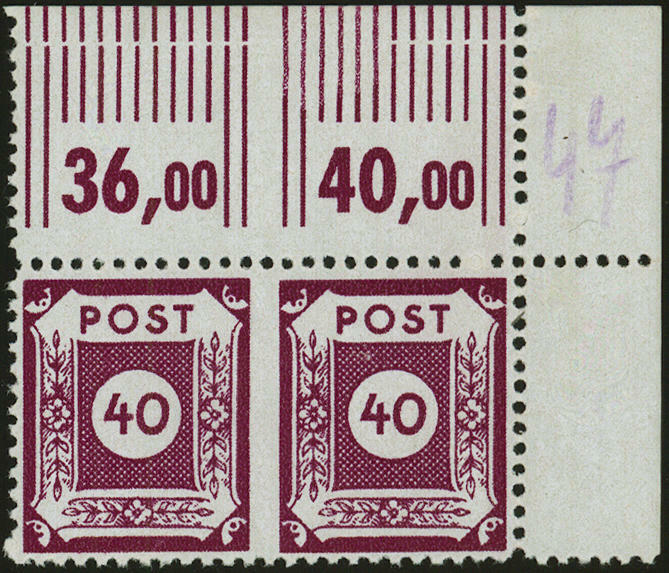 Dark-orange-brown on bright orange brown in double impression, unperforated, in perfect condition mint never hinged, scarce variety, photo expertize \"genuine and immaculate\" Ströh BPP. Michel 650,- €.